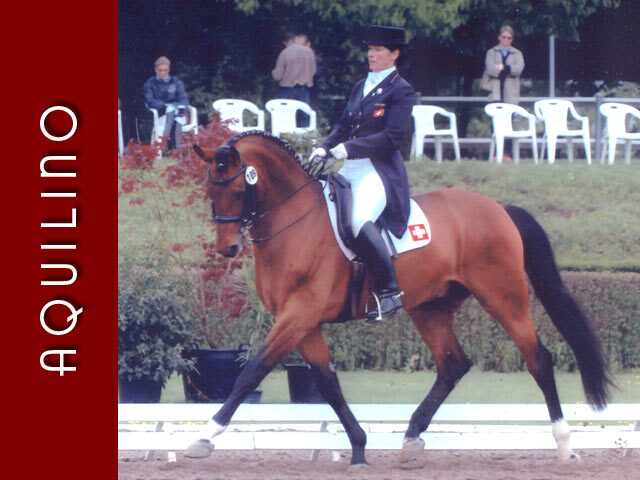 The announcement at the end of the year 2004 made an impact: Aquilino (started breeding in 1997) took 1st place in North Rhine Westphalia according to the total prize money earned by his offspring. 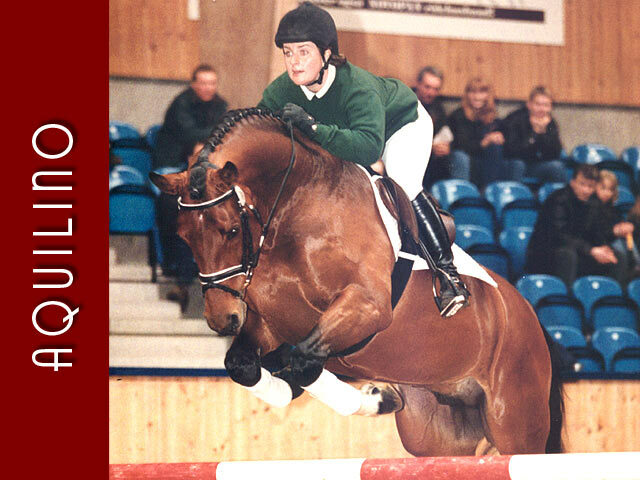 Be it dressage or show jumping - the double talented stallion passes on his genes sensationally in both disciplines. 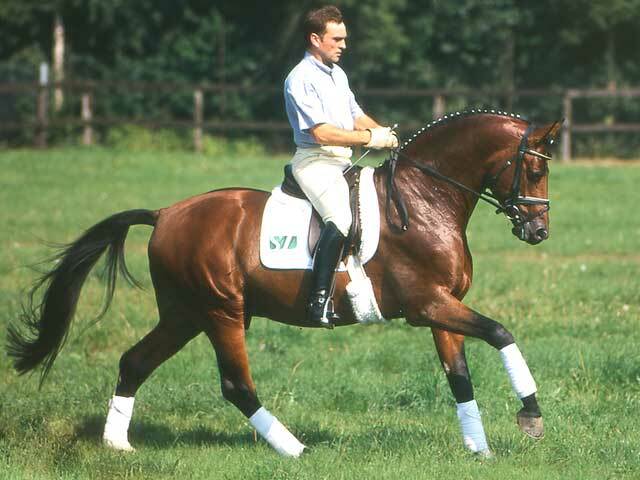 He belongs to the top 5 % on the German Federation´s Breeding Premium Ranking List. Good news for the breeders: St. Ludwig makes it possible for its breeders that Aquilino will be at their disposal immediately. That Euro-stallion passes on nobility and motion sequence. His crop are much sought after abroad: Netherlands, Belgium, Sweden, Denmark, Switzerland. 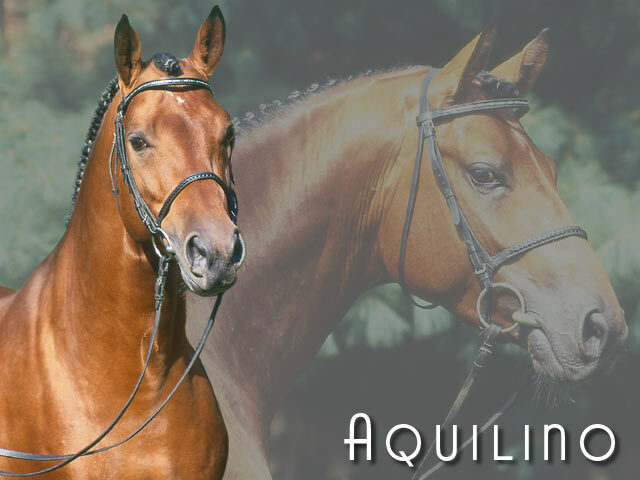 The new owner Eva Senn (participated at the European Championship in Lipica and Mondorf, at the World Championship in The Hague and in the Olympics in Atlanta - rank 6 -, in the World Cup Finales in Gothenburg) has trained Aquilino up to Grand Prix. For his breeders, too, Aquilino will be a representative in sports on international level in the future. He will be a figurehead through his advertising effect. Already the first crop in 1998 was overwhelming. Two years later his first two sons were approved. 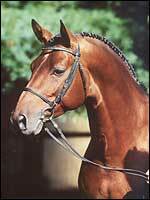 Aquilino produced foals that won gold and silver medals en masse. He passes on his charisma to his offspring without exception.